January 10, 2013 at 11:00 a.m.
George Bernard Benta, who as executive director of Benta's Funeral Home in Harlem personally supervised the funerals of such notables as Langston Hughes, Hall Johnson, James Baldwin, Sandy Sadler, Etta Jones, Coleman Hawkins, Paul Roberson, Alvin Ailey, Pearl Primus, John Henrik Clarke, Matthew Henson, among others, has died. He was 91. Funeral services were being held today, Jan. 10, at 11 a.m. at St. Philip's Episcopal Church, 204 W. 134th St., New York. Benta was born on Sept. 3, 1921, in New York City, the second child of George Alexander and Margaret Sharry Jane Benta. His mother passed away when Bernard was 3, but his stepmother, Helena Frye Benta, helped raise him and his siblings. Benta attended Frederick Douglass Junior High School, PS 139, where he had famed writer Countee Cullen as his teacher. He graduated from Textiles High School. At 17, Benta entered the military. After receiving an honorable discharge from the Army, he returned to New York and worked in the U.S. Post Office with his father. Shortly afterward, his father left the postal service to start a mortuary business--Reed and Benta Funeral Home--with a partner in 1928. Benta followed his father into the business. The business later became Benta's Funeral Inc. and operated from a brownstone on 132nd Street, before moving to a larger facility. Benta was very proud that each of his children, like himself, became funeral operators. He later founded Alegacy Coaches, a luxury car and limousine service. Benta married Pearl Marjorie McLeod, whom he had met as adolescent attending St. Philip's in 1946. He is survived by his second wife, Marilyn Benta; his children, Karen Patricia Diane, George Bernard Kevin and Kyle Phillip Michael; his daughters-in-law, Carol Benta, Robin Benta, Dorrence Benta, and his grandchildren, Elsa Rodriguez Williams, George Jason Alexander Benta, Whitney Gayle Benta and Olivia Eduvigis Pearl Benta. As a funeral director in Harlem for more than six decades, George Bernard Benta delivered his personal brand of service for luminaries like Langston Hughes, James Baldwin, Paul Robeson, Etta Jones, Coleman Hawkins, Gil Noble and Alvin Ailey. He also tended to other well-known people after they died, including Wesley A. Williams, the first black lieutenant in the New York Fire Department; Richard Parrish, a leader in the freedom school movement; and, Kenneth B. Clark, the psychologist whose research helped overturn racial segregation in the nationÃƒÂƒÃ‚Â‚ÃƒÂ‚Ã‚Â™s public schools. But Mr. Benta made sure to treat everyone celebrities, politicians and blue-collar workers alike ÃƒÂƒÃ‚Â‚ÃƒÂ‚Ã‚Â” with dignity and respect. And he did it with his distinctive reverence and polish. ÃƒÂƒÃ‚Â‚ÃƒÂ‚Ã‚ÂœHe liked to do things that were flashy, that no one else was doing,ÃƒÂƒÃ‚Â‚ÃƒÂ‚Ã‚Â� said his former daughter-in-law, Dorrence Benta, a member of the.family business. Beyond the standard hues, he offered families a choice of colorful hearses to transport their loved ones. They could pick gold, green or red. And they could have a coffin to match. During viewings and services, Mr. Benta and his staff wore elegant suits, with pinstripes, long coats and gray gloves as they went about memorializing the dead and consoling families. If someone left the light on he would let the staff know: ÃƒÂƒÃ‚Â‚ÃƒÂ‚Ã‚ÂœMy name is George Benta, not Thomas Edison. If he spotted a paper clip on the floor, he would wonder how it was that he was the first to see it and pick it up. His other philosophy: Cater to the deceased, but do not forget the living. Mr. Benta incorporated techniques from the hospitality industry. BentaÃƒÂƒÃ‚Â‚ÃƒÂ‚Ã‚Â™s Funeral Home, which opened in 1928 and is among the oldest in Harlem, offers families a private room to gather themselves . Mr. Benta ran the business 24 hours a day, seven days a week, and on holidays. If no one answered the phone at the front desk, the call was automatically forwarded to Mr. Bentas home and then to the homes of his three children. If clients did not have the money to pay for services, Mr. Benta would try to work out some sort of arrangement. Sometimes they ended up paying nothing at all. Mr. Benta was born in Harlem in 1921. His father had moved there from Antigua, and, by family accounts, was a stern and proper man. In one story, Mr. Benta told his family how his father would leave the house every day wearing a crisp suit for his job at the post office. One day when he forgot something, Mr. Benta took it to him, and stood staring at his father in shock. There he was, running around, sorting mail, not in his suit, but in a Postal Service uniform. I always remembered that story,ÃƒÂƒÃ‚Â‚ÃƒÂ‚Ã‚Â� said his granddaughter Whitney Gayle Benta.ÃƒÂƒÃ‚Â‚ÃƒÂ‚Ã‚ÂœThe pride his father had. You had to take that much care in your appearance, so you could get respect. Mr. BentaÃƒÂƒÃ‚Â‚ÃƒÂ‚Ã‚Â™s father went to mortuary school and opened a funeral home in the family brownstone. Mr. Benta eventually joined the business, and persuaded his father to expand. They eventually bought a six-story building on St. Nicholas Avenue near 141st Street. The funeral home operated on the ground floor, and the family lived in one of the 40 apartments above it. For Mr. BentaÃƒÂƒÃ‚Â‚ÃƒÂ‚Ã‚Â™s service, some 700 programs have been printed. His grandson Jason Benta booked a jazz band to play at the viewing on Wednesday at the funeral home that he made into a neighborhood institution. And on Thursday, at an Episcopal church in Harlem, his family will do for him what he had done for so many. George Bernard Benta was born on September 3, 1921 in New York City, the second child of George Alexander and Margaret Jane Sharry Benta. Margaret Benta passed away when Bernard (as he was called) was 3 years old. His father then married Helena Frye Benta, who helped him raise his children and was lovingly referred to as "Aunt Helen." Bernard shared a special bond with his sister, Bernice Benta, with whom he was very close and who unfortunately passed away in 1984. Bernard attended Frederick Douglas Jr. High School, PS 139 where the famed writer Countee Cullen was his teacher. (In later years Bernard proudly told of how Countee Cullen referred to him as brother Bente.) He received his high school education at Textiles High School. At 17, although he was not legally old enough, (fibbed about his age) he enrolled in the 369th infantry, and became a proud member of the National Guard. He later joined the United States Army where he ascended to the rank of Corporal. During his tour of duty he was initially stationed in Oswego, New York and was transferred to Hawaii after the tragic bombing of Pearl Harbor. He was later sent to Okinawa but was discharged a couple of weeks after his arrival. He served in World War II from 1941 to 1945. After receiving an honorable discharge from the Army, Bernard returned to New York and worked in the U.S. Post Office with his father. Shortly thereafter, Bernard's father left the postal service to begin the family business with a partner in 1928. The business was known as Reed and Benta Funeral Home, Inc located on 135th Street. Bernard, always wanting to make his father proud and follow in his footsteps, attended the New York School of Embalming and Restorative Arts, and became a licensed funeral director. Upon graduation he assumed his place in the family business with his father and step-mother at the funeral home. As an adolescent attending St. Philip's Episcopal Church Bernard befriended Pearl Marjorie McLeod and relentless proclaimed "I'm gonna to marry you one day." True to his word they were married in 1946 and remained so until her passing in 1989. To their union, three children were born, Karen, Kevin and Kyle. Bernard's children remember him as a strict but loving father who would give lectures about behaving well as he walked them to school. Being a stickler for higher education Bernard encouraged his children to attend college as well as mortuary school. He was very prideful that Pearl and each his children became funeral directors. The business started by his father later became Benta's Funeral, Inc. where it operated from a brownstone on 132nd Street. The family lived on the top floors and operated the funeral home on the first and parlor floor. Under Bernard's leadership he convinced his dad to make the bold move to build a new facility, a larger funeral home. The structure he envisioned materialized into an apartment building and funeral home, which was the genesis of forming the Wilmack Holding Corporation. The funeral home was moved from the brownstone to its present location in Harlem in 1964. Ambitious and constantly striving to improve, he always reinvested in the business by frequently updating the interior dÃƒÂƒÃ‚ÂƒÃƒÂ‚Ã‚ÂƒÃƒÂƒÃ‚Â‚ÃƒÂ‚Ã‚Â©cor and facilities. He was a leader and innovator in the funeral home industry, being the first to use hearses in colors such as red, gold, green and brown. He continuously strategized on ways to raise the level of service to the families he served. Bernard Benta has led Benta's Funeral Home for over forty years of its eighty five years of service. He later founded Alegacy Coaches, a luxury car and limousine service. Bernard's commitment to the community was evidenced by his generous contributions to numerous local causes and institutions, as well as serving as a member of various boards, some of which were The Chauncy M. Hooper Towers, The Greater Harlem Nursing Home and the Antigua Progressive Society. During his healthier and more vibrant years he was a member of the National Funeral Directors and Mortician's Association, (Empire State Funeral Directors Association, Greater New York Funeral Directors Association now known as Empire Funeral Directors Association), National Funeral Directors Association, 369th Veterans Association, and the Harlem Business Alliance. He was class personified. He carried himself with dignity and respected everyone, whether they were a family that trusted him to carry out the home going of their loved ones or a member of the community. 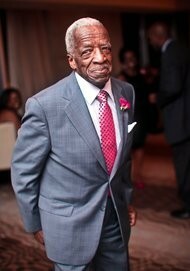 He was trusted by many families in the Harlem community and beyond. He personally supervised the funerals of some of Harlem's Historic notable figures such as James Langston Hughes, Hall Johnson, James Baldwin, Sandy Sadler, Etta Jones, Paul "Hucklebuck" Williams, Coleman Hawkins, Paul Robeson, Alvin Ailey, Adolph Caesar, Pearl Primus, Dr. John Henrik Clarke, William "Pop" Gates, Matthew Henson, and many others. He left a legacy of superb service to the extent that even after his retirement, his family continued to value and help other families celebrate the legacy of their loved ones, whether they were neighbors from around the block, African royalty, judges, politicians or number runners. He often said it is the regular, hard working people of the Black community that kept Benta's in business. Due to his exposure to the cultural richness of the Harlem Renaissance, Bernard was a history buff on all things Harlem. In 1990, Bernard married Marilyn (White) Benta and the two enjoyed a happy marriage for 22 wonderful years. Marilyn was very devoted to Bernard (or "doll baby" as she called him) and took great care of him until the day he passed away. Bernard is survived by his wife, Marilyn Benta, his children, Karen Patricia Diane, George Bernard Kevin and Kyle Phillip Michael, his daughters-in-law, Carol Benta, Robin Benta, Dorrence Benta and his grandchildren, Elsa Rodriguez Williams, George Jason Alexander Benta, Whitney Gayle Benta and Olivia Eduvigis Pearl Benta and a host of extended family and friends. An Online Memorial was created to commemorate the life of George Bernard Benta. You are invited to add a Tribute in his memory.